A new Vibe Hotel is set to open on Queen Street Melbourne in late 2019. 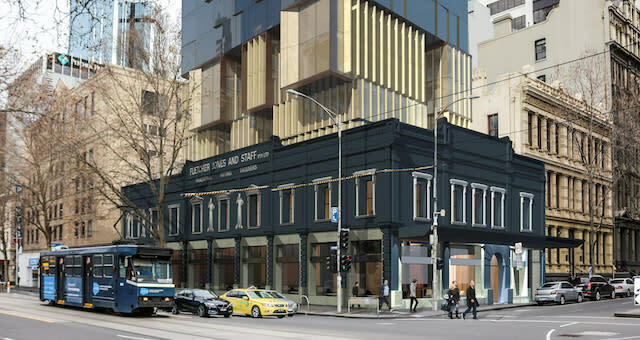 Construction has started in and above the former Fletcher Jones showroom on the corner of Queen and Flinders Streets. The original two-storey building was built in 1873 in the Renaissance Revival architectural style and was called the Cobden Building, first serving as offices for the maritime trade. The building’s façade will be preserved and a 24-storey glass-fronted tower will be added to mark the links between old and new. The upper levels will have views of the Yarra River to Port Phillip Bay, and city views to the north and south-east. The new Vibe Hotel Melbourne will have 206 rooms, communal areas and a building design that tells a story via four distinct ‘layers’ or strata; heritage, transition, tower level and the crown.